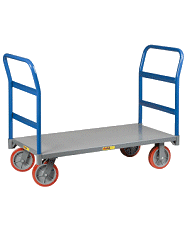 Overall Length (platform mode) - 56"
Height as Truck - 61 1/2"
Height as Platform - 46"
Platform bed Length - 51 1/2 "
Platform Heigth from floor - 11"
This convertible hand truck is easier to put in and out of the stan up mode. The face plate is large and makes handeling cartons easy. In the cart position it holds quite a few cartons and it is easy to handle. Strong and durable I use it every day to carry large computer equipment. So easy to fold up and down, this hand truck should last a very long time.